12 inch 2-Speed Nicely built, lightweight, efficient, quiet and powerful, makes a good breeze, draws about 1 amp or 15 watts on low and 3 amps or 40 watts on high. Adjustable tilting base can be wall mounted. Includes 6' cord with both lighter plug and battery clips. 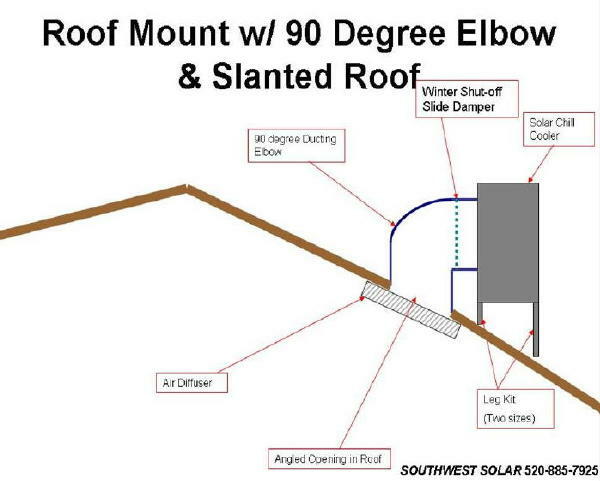 Can be used directly with a solar module. Estimated 450 cfm on low and 900 cfm on high at 12.0 volts. A 5 amp GMA 5mm x 20mm glass fuse is between motor and switch. 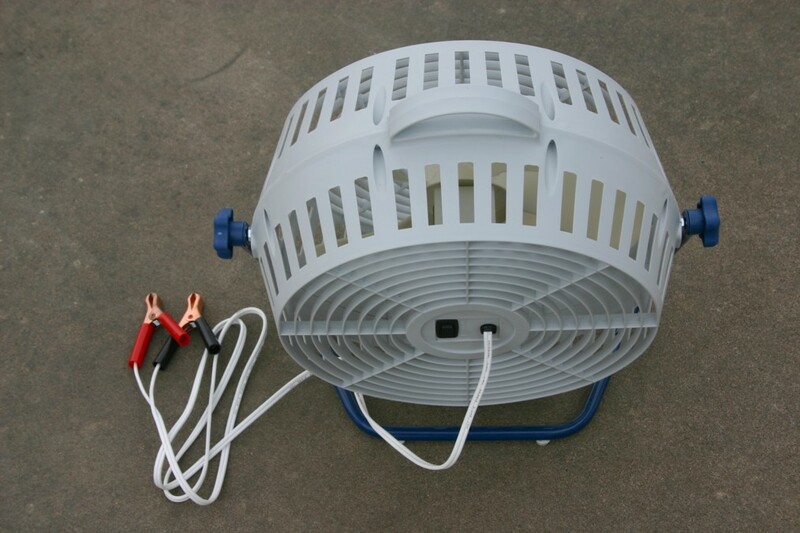 Not weatherproof, do not allow fan to get wet. 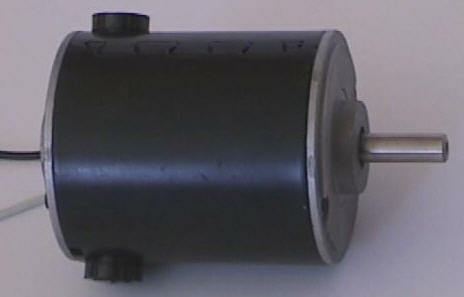 Efficient ball bearing, permanent magnet motor quietly moves more air with less watts. 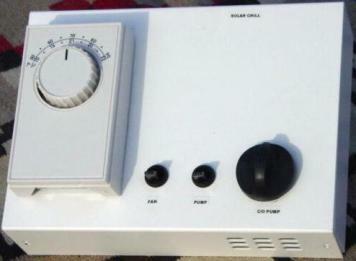 Variable speed (PWM) control with maximum draw of only 4 amps. 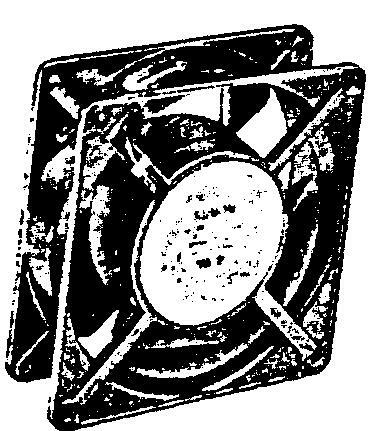 Adjustable tilting base can point fan to any angle. 9 foot cord plugs into cigarette lighter outlet or use included adapter for direct connect to battery terminals. Estimated 3000 cfm on high. 1 year warranty. HTI Motor Replacement DC Venturi fan motor. 3" diameter x 4-1/8" long plus 3/8" diameter x 1-11/16" long shaft. 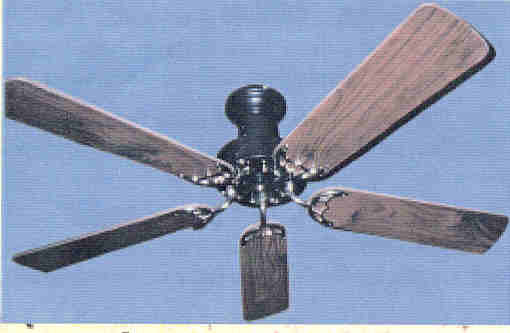 DC Ceiling Fan. Use winter or summer. 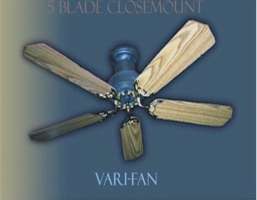 Efficient Vari-Fan can be used with 4 or 5 blades and mounted flat on ceiling or hung from its 4” down rod (or make a longer down rod with 1/2" thick walled plastic conduit). 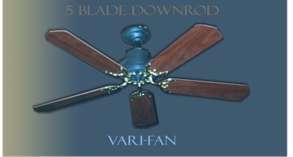 Reversible wood blades are light oak on one side and dark oak on the other. 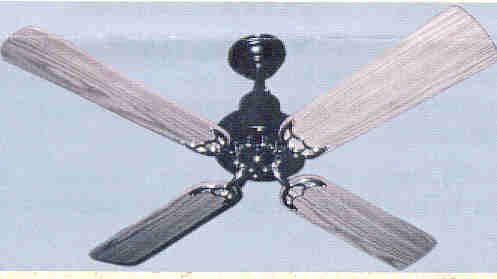 Durable ABS plastic base with black matte finish which can be painted other colors. 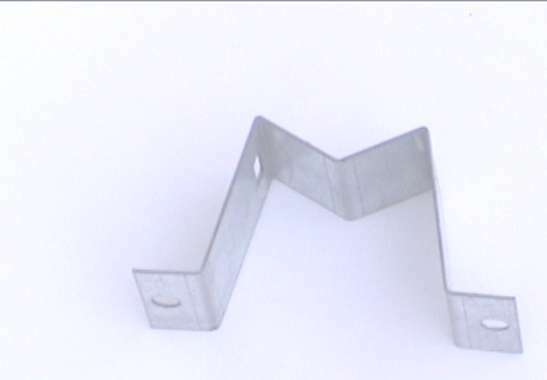 Blade brackets have brass finish. Uses 0.5 amps on 12 volts (5 watts), 60 rpm/1500 cfm or 0.8 amps on 24 volts with twice the speed (120 rpm/2700 cfm). 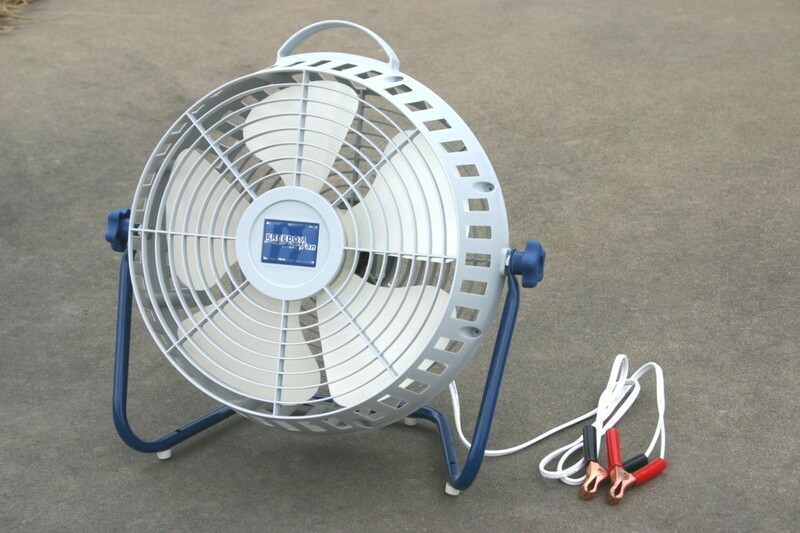 Use 12/24 fan speed control (below) to allow full fan speed on a 12 volt battery. 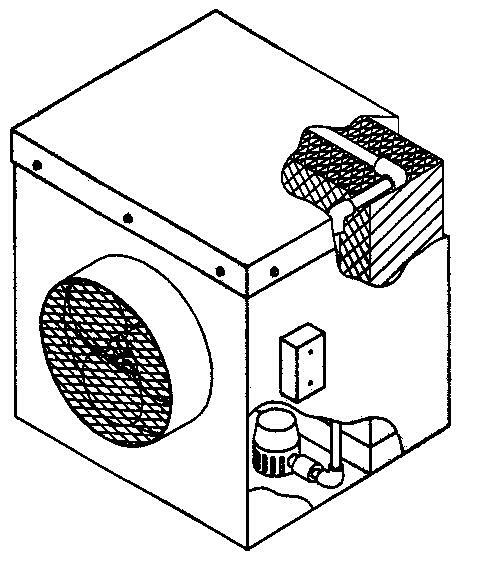 Permanent magnet motor. Made by Nextek. 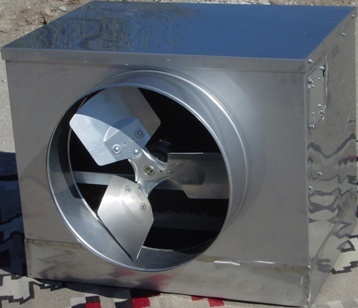 The Solar Chill™ evaporative cooler's housing is made of stainless steel. The efficient 8" thick wetted pad can last 5 years. The 24 has the best air flow and pressure and is be the best for use with ducts. 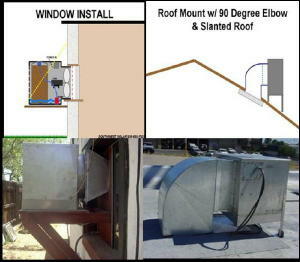 Ducts are not recommended but if used they should be short and oversized. 1 year warranty by manufacturer. The 24” and 42" models ships by truck freight collect. The first 2 numbers of model are Fan Diameter, second 2 numbers are voltage. Output diameter is 3/4" larger than blade diameter. Max GPH is the maximum Gallons of water used Per Hour. 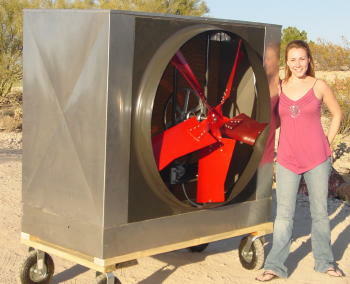 Units can be powered by solar electric module direct but it is normally best to run from a battery. 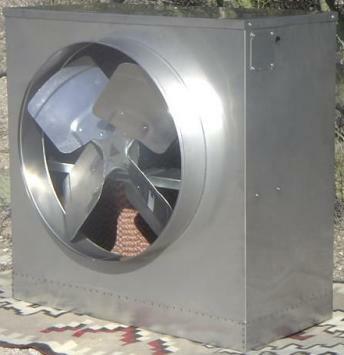 Sizing units: In a dry climate, use about 3 CFM (cubic feet per minute of air moved) per square foot of space to be cooled if normally insulated with not much solar gain. 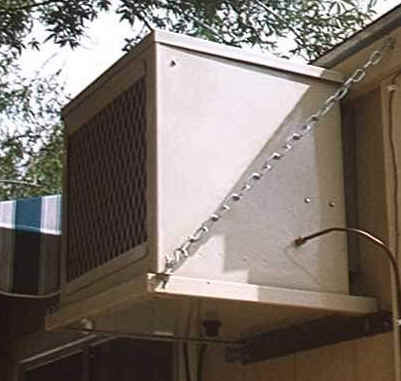 It will take more to cool a space that is poorly insulated or has many windows on east or west sides, such as trailers or RVs. 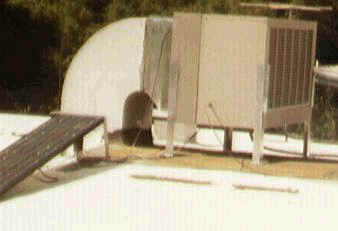 About 8000 BTU's of cooling is produced for each gallon of water evaporated. Rates can vary from 1 to 7 gallons per hour. Water Pumps: Water is pumped from a reservoir to the filter and evaporation media and drains back to the reservoir. The optional clean-out pump and timer are available to empty reservoir daily. This reduces mineral and dirt buildup and increase media life. The circulation pump and clean-out pump are the same pump and may be used interchangeably. For automatic water cleanout use pump on a timer. The optional control package with thermostat will improve cooling performance and reduce humidity buildup by automatically turning cooler on and off as needed. Wall mounted control box contains a thermostat, a two speed (HI/LOW) fan switch, a pump switch, and a timer for the cleanout pump. Set the thermostat and go to sleep without worrying about wasting energy or getting too cold. 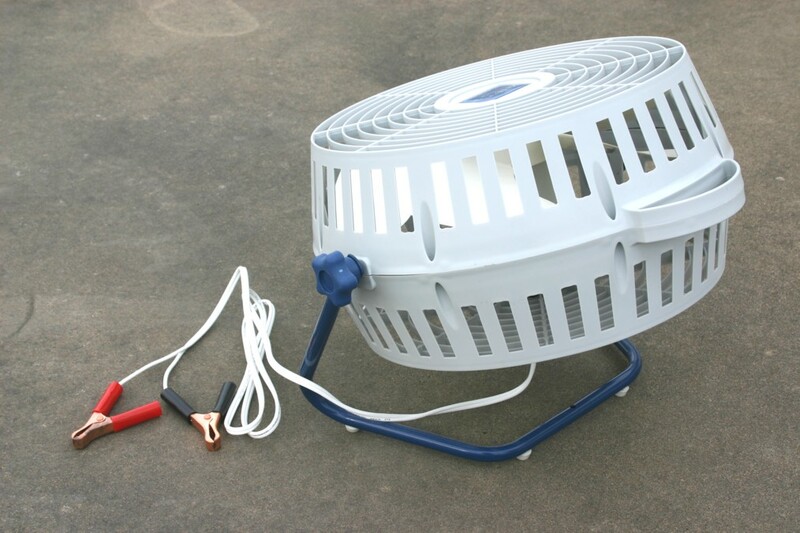 Run just the fan at night to conserve energy and water or just the pump for a few minutes to get the pad wet before firing up the cooler. The cleanout timer runs a pump that will flush out all the water and harmful minerals from your cooler for five minutes which extends the life of the pump, pads, and cooler box. 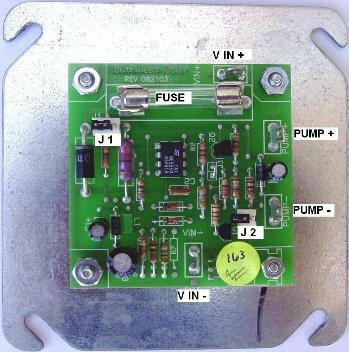 Pump control timer board is an electronic circuit board mounted to the back of the electrical cover plate. This board can be added to any of our 12, 24 or 48 volt coolers as an upgrade and is now installed standard on all new coolers in all voltages! What does it do? 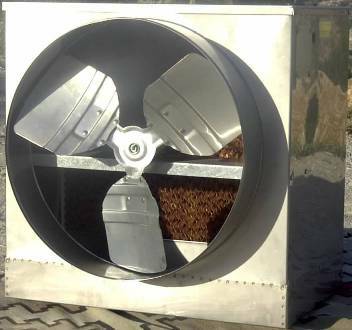 The pump board has 2 main functions: to lower the output air temperature, and to increase the efficiency of the cooler by decreasing the amount of energy used, and increasing the life of the pump by decreasing the duty cycle. The pump board has a built in timer that turns the pump on for two minutes and off for three. How does this decrease the temperature of the cooler output air? Since there is not a steady flow of water passing over the pad at all times the water held in the pad has a chance to get colder than it would if it was flowing over the pad consistently. With evaporative cooling as the pad gets colder the output air also gets colder. 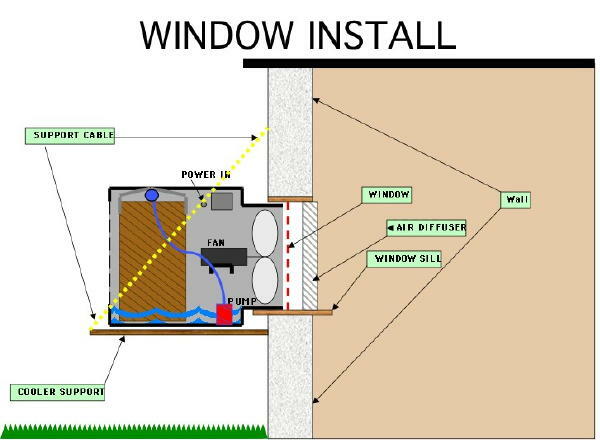 The pump board also lowers the amount of energy used since the pump is "on" for less than half the time, and it will as extend the life of the pump. Predicted cooler performance in relation to the outside humidity and temperature. 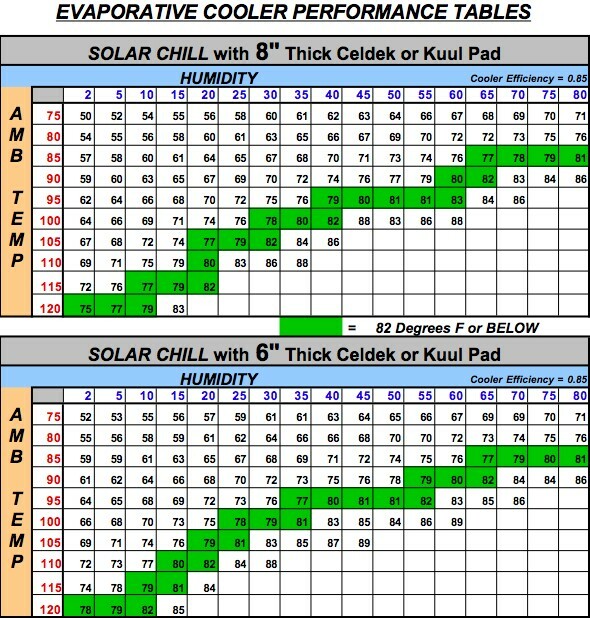 To find out if evaporative cooling will work well in your area/region, locate your average afternoon temperature and co-incident relative humidity, then locate the cooling level that may be achieved on this chart. Please note the difference in performance between 8" pad media and 6" pad media. 8" is standard. For for this system to work well, the windows must be partially opened to allow air to escape, which allows the freshly cooled air to enter. If the windows are closed, the exhaust and intake air will be restricted, and the building will become pressurized and not cool well. The intake of fresh cooled air will be blocked. 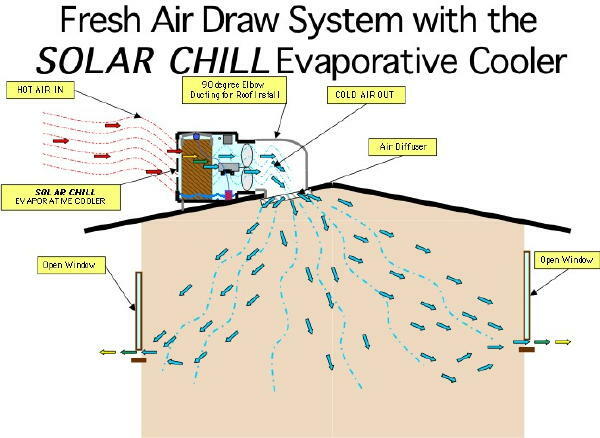 Through the use of the SOLAR CHILLtm Evaporative Coolers, the diagram shows how the cooling system works without the use of duct work. It is preferable to eliminate the ductwork and use the building as the ductwork instead. This is more energy efficient by reducing the friction to air flow that ductwork causes, and saves you the cost of the ducts!